In this post, we examined 5 of the best-selling can openers. Can openers are devices used to open metal cans. Old can openers were hand powered while today you can find openers that are electric (Source). Whether they’re hand-powered or electric, most can openers use a wheel with sharpened edges that cuts into the can. As the wheel is turned around the circumference of the can, the “lid” is removed (Source). When buying a can opener it’s recommended you buy one with stainless steel blades and components as these resist corrosion and are more durable. Also, when buying an electric can opener, buy one that’s tall enough to accommodate large cans or one that can be wall mounted so you don’t take up too much space (Source). In this article, we look at 5 reasonably priced can openers that should be good for any kitchen and use case. The Kitchen Aid can opener is hand powered and features a strong, stainless steel cutting blade that makes puncturing and cutting cans easy. The gears operate smoothly and make can opening quick. It has thick, ergonomic handles for good grip even with wet hands. The EZ-DUZ-IT deluxe is another hand powered model that is made of chromed steel rather than stainless steel. The cutting blade is made of carbon steel, which is durable and remains sharp for a long time. This opener is made in the USA and while it’s a no-frills basic design, most buyers said they’re pleased with their purchase. The Hicober can opener is another manual can opener that is an all steel construction, which while durable, isn’t rust proof. The blade is sharp and made of stainless steel and the handles feature a no-slip rubber grip that’s comfortable to use even with wet hands. What makes this product stand out is the company’s lifetime warranty. 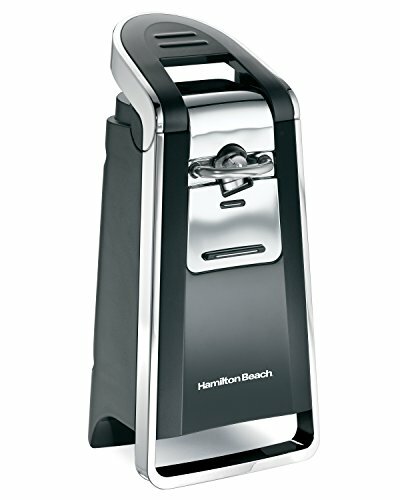 Up next is the Hamilton Beach Smooth Touch, which is an electric can opener that easily opens all standard cans and cans with pop lids. The electric motor allows you to open cans without effort, but the downside is that the blade is likely to wear out before the motor. The cutting mechanism cuts into the side of the can and assures a clean cut with no sharp edges. Although a large appliance, the cord stores in the back, which makes it easier to store away. Last up is the ZYLISS Lock N Lift which is a hand operated can opener that features a magnet that lifts the “lid” off the can once it’s opened. This reduces the chance of you cutting yourself having to fish the lid out if it drops into the can. The gears operate smoothly with no jerking and the cutting wheel is stainless steel. 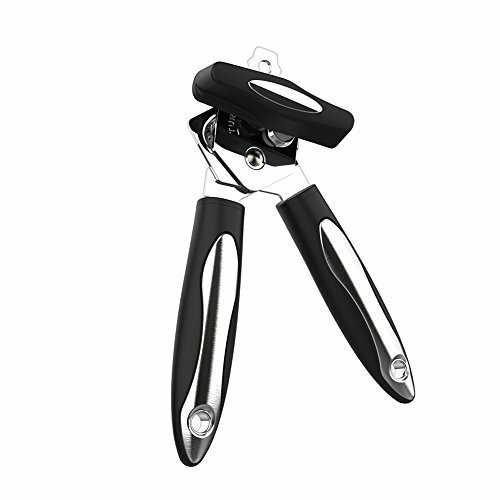 Like other manual can openers, this features large, ergonomic handles for easy gripping and it comes with a 5-year guarantee. Most users agreed this is an attractive can opener, but many said puncturing the can to begin cutting was difficult. This manual can opener offered by Zyliss is handy, well-designed, and an excellent choice for opening cans of all sizes. 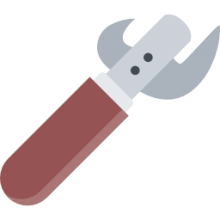 Users love the quality and price of the tool, but some do note that it’s not as durable as they expected. The Zyliss lock n’ lift can opener features a smooth turning, stainless-steel cutting mechanism that opens cans quickly and efficiently in combination with a magnet which lifts the lid off the can. In addition to this, this handy can opener has a comfortable, soft touch handle, which makes it perfect for people with arthritis. The can opener also comes with a 5-year Zyliss guarantee and it’s easy to clean – you just have to hand wipe it. A reviewer mentions that this is one of the easiest can openers to use due to the automatic locking mechanism and that the handle has a soft rubber padding. He adds that Zyliss can opener is sharp and light. Another user shares that this is one of the best can openers he has owned in the past several years and that the magnet feature works wonderfully. But the reviewer warns that the locking mechanism is made of plastic and it will probably break in time. A buyer also states that this is perfect can opener for people with arthritis and that it cuts the cans well. However, some customers have noted that the magnet feature is not working as it should and that the opener doesn’t cut the lid completely. If you’re looking for a handy can opener for your kitchen, you might take a look at this electric can opener offered by Hamilton Beach. Users love the quality of the product and the Frustration-free packaging option, but some do note that the cord is too short. The Hamilton smooth touch can opener features a side-cutting system, which removes the top and leaves smooth edges in addition to a large ergonomic lever for effortless cutting. The electric can opener measures 5”x 4” x”9”, and it’s suitable for standard cans and pop-top lids. In addition to this, you get a 1-year warranty, and you can choose a model with scissors. As a whole, reviewers are impressed by the functionality and performance of the Hamilton smooth touch can opener, and they highly recommend it. A buyer comments that this touch can opener arrived completely assembled and that you just have to plug it and you’re ready. He adds that this opener is easy to clean and that it cuts smoothly. Another purchaser mentions that this is the best electric can opener he has ever used and that it takes little space. A user shares that the opener is solid and well-built and that the cord is around 26” in length. He warns that you have to remove the plastic shield beneath the blade to use it. However, some customers have noted that the electric car opener stopped working far quicker than they expected and that it doesn’t open all cans. This manual can opener is compact, easy to use, and suitable for opening large cans. Users love the quality and sharpness of the opener, but some do note that it doesn’t have a magnet. The Hicober manual can opener features a durable food-safe steel construction, a polished chrome head, a stainless steel cutting blade, which can handle cans of various size, and a high-carbon cutting wheel. Another great thing about this opener is that it has light, non-slip handles, which provide a secure grip and fit the hand comfortably. In addition to this, this manual can opener has a built-in pop top bottle opener and an ergonomic knob for easy turning. As a whole, users have a favorable opinion of the Hicober manual can opener, and they praise its design and performance. A buyer comments that the opener feels great in his hands and that the gearing mechanism works smoothly. Another reviewer adds that he has used the can opener for a while and that he hasn’t encountered any problems. He also notes this is one of the easiest can openers you can find. A user states that it cuts well and that the handles are very comfortable and easy to grip. However, some customers have noted that this manual can opener broke after opening several cans and that it’s not as durable as they expected. 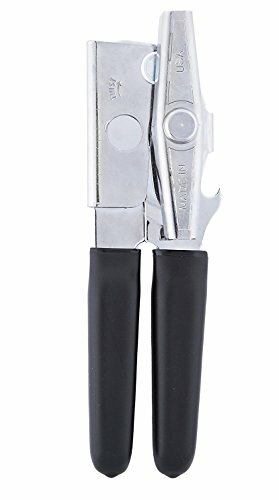 If you want to open cans with minimum effort and without cutting your fingers, you might consider this deluxe can opener offered by Ez-Duz-It. Users love that the opener is made in the USA, but some do note that it’s not as long-lasting as they expected. The EZ-Duz-It can opener measures 7.25 inches in length, and it features a heavy-duty swing design, a carbon steel cutting blade, and thick rubber handles for convenience. Another great thing about this product is that it’s made of heavy gauge chromed steel for durability. What’s more, you can clean the opener by washing it with warm soapy water. A reviewer comments that he has used the EZ-Duz-It deluxe opener to open cans of all sizes and that it hasn’t disappointed him so far. He adds that the can opener grips and cuts well and that there are no sharp edges left. Another user mentions that the rubber handles are comfortable and easy to hold and that opening mechanism is flawless. He highly recommends it as one of the best cheap can openers. A buyer adds that the can opener is made of thick metal and that it feels heavy-duty and solid. However, some customers have noted that the deluxe can opener broke too quickly with minimum use and that it rusts in a couple of months. This handy can opener offered by KitchenAid is cheap, well-made, sturdy, and available in nine colors. Users love the price and the design, but some do note that it doesn’t have a magnet. The KitchenAid can opener features a cutting blade made of stainless steel which will puncture with ease all types of cans, and a large, easy to grip knob for your convenience. Another great thing about this product is that it has ergonomic handles which fit in your hands comfortably. Moreover, this easy to use can opener has a lifetime limited warranty and 1-year hassle-free replacement. And it’s a piece of cake to clean the opener – you just have to wash it with warm water and mild detergent. In general, users have a favorable opinion of the KitchenAid manual can opener, and they are pleased with its design, sharpness, and construction. A reviewer shares that the opener is well-made and that it will last years if you take proper care of it. He highly recommends it as one of the best can openers and advises that you clean it after each use. 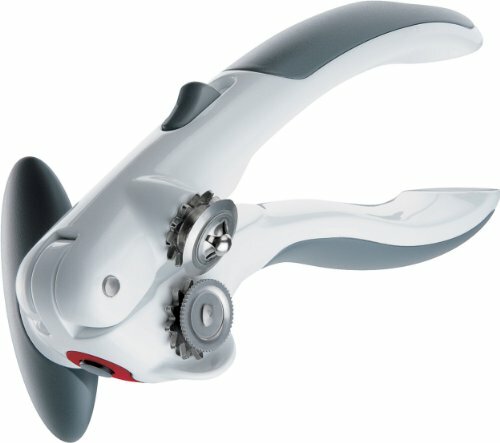 Another buyer comments that this manual can opener works great and that it’s perfect for a gift. A purchaser also observes that it’s easy to use the can opener and that it cuts smoothly. However, some customers have noted that the can opener started to malfunction in a couple of months and that the handles are plastic. Some also remarked that it rusted. Blades Made of Stainless-steel. These blades are especially durable. They resist rust and corrosion. Comfortable handles. Can openers with rubber or non-slip grips are easy to use. These are considered to be the best can openers. Reasonable size. The can openers that are worked by electricity must be at least as tall as needed to adjust the cans of largest size to be opened, and the finest manual models should be easily fitting in the kitchen drawer. Cabinet- or wall-mounted can openers should be considered if the drawer and the counter are tight. Low-effort and smooth performance. Do not make do a can opening devices that may slip off, are difficult to be fixed onto the can, as well as leave the can mid-cut or that is not easy to turn. You can find various can opening devices – both electric and manual – that are handy and long-lasting. An easily-cleaned design. 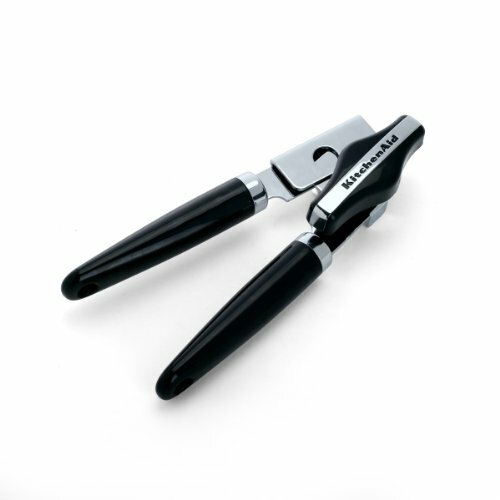 Some kinds of side-cutting can openers do not touch any food inside the can, so that their blades remain clean. Top-cutting non-manual can opening models should have assemblies that are able to be removed for easy cleaning (for instance: dishwasher-safe), otherwise, they will quickly get full of gunk. Many top-cut manual can openers are washed only manually. A durable build. Those can openers that that are worked by electricity should be as heavy as not to flip over every time you attach large cans. Manual can opening devices of high-quality cut and turn fluidly and smoothly years after years. Sidecut or top cut? Both of these can openers have pluses and minuses that could become anyone’s best choice. See our opinion and comparison in the introducing part of this report. No matter which type of can openers – handheld and electric – are the most suitable for your household, both of them are available. Is the counter or the drawer tight? Most electric mechanisms hold on the counter, make sure you have got enough space for it. Alternatively, you can have an under-cabinet mechanism. Some types of manual can opening instruments surprisingly take up a lot of space; so take the one that easily fits in the kitchen attachment (or a wall-mounted type may be considered). Are you studious about cleaning the opener? The blades of a top-cut can opening mechanism can actually reach the food that is inside the can, so you need it to be regularly hand-washed (or find a dishwasher-safe one). In case of electric models, the removable blade parts are easier to clean, though it will be hard to get off and on. Side-cut can opening models usually stay cleaner as they generally do not touch the food. How is your ability to hold firmly? If you have lack of hand strength, it is better to take an option on an electric opener, or you your benefit from an opening model with longer handles; they take less effort through providing better leverage.